The government’s slew of further tightening measures will have a major impact on the public housing market, said analysts. The policies which took effect on Saturday include an additional buyer’s stamp duty (ABSD) on permanent residents (PRs) buying their first residential property and on Singaporeans purchasing their second residential property, as well as tighter eligibility for loans to buy HDB flats and requirements for owner-occupation by PR buyers. The news comes hot on the heels of HDB’s flash estimates which revealed that resale flat prices grew by 2.5 percent in the last quarter of 2012, their fastest pace for the year. The latest cooling measures is to moderate the housing prices and instill greater prudence in financing HDB flat. The revised ABSD will impact the PR segment most. “PRs will now have to raise an additional five percent cash outlay to pay for the ABSD in their purchase of the first resale flat. PRs now make up about 20 percent of the HDB resale market, demand for such units are likely to ease in the coming months. Moreover, PRs who could only borrow from financial institutions for the purchase of resale HDB flats are now going to be restricted by the Mortgage Servicing Ratios (MSRs) for loans. This will greatly reduce the quantum that they can borrow as the ratio is now being reduced to 30 percent of the borrower’s gross monthly income (originally 40 percent of the borrower’s gross monthly income). PRs will also be barred from subletting and must sell their flat within six months of purchasing a private residential property. Currently, PRs own 49,190 out of the one million HDB flats and the 2,142 PR rented flats form about five percent of all approved flats for sublet. Many locals has been calling the government to bar PRs from buying resale HDB flats which are in the first place a subsidized public housing meant only for Singapore citizens. The prices of HDB flats has escalated rapidly since 2006, that particular year MND had allowed PRs to purchase our subsidized flats on the resale market thus reducing the supply for locals who desperately needed one. 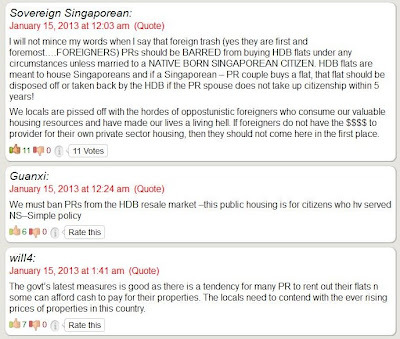 There has been far too many cases where PRs broke HDB rules and sublet their properties either part or whole to foreign workers of their same nationalities illegally and earning a side income without seeking approval from HDB. There are also those who speculate and plan to sell the flat at high open market prices and return to their countries. They do not have any intention to sink their roots here. Our government is well aware of this and they should instead impose a strict condition, a law for these PRs who had purchased resale HDB flats that they must have intention to sink their roots here and are given 5 years to convert to Singapore citizenship. Otherwise their flats will be repossessed. 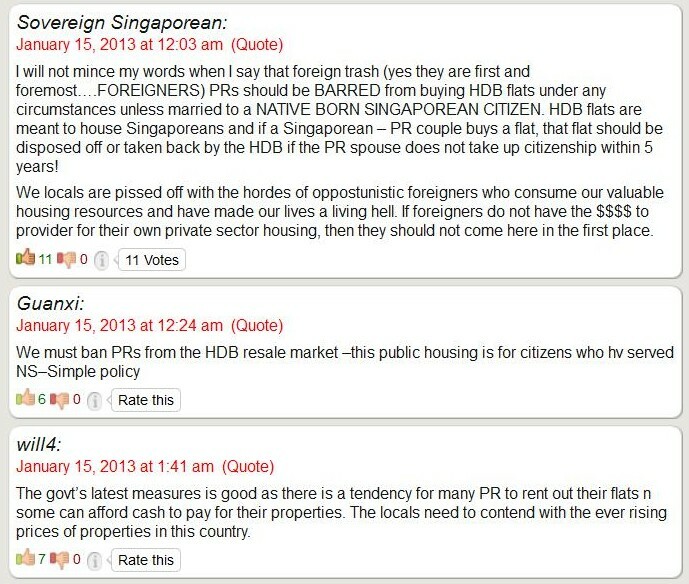 PRs who do not intend to become Singapore Citizens should only rent HDB flats either from the open market or rent or purchase private properties.